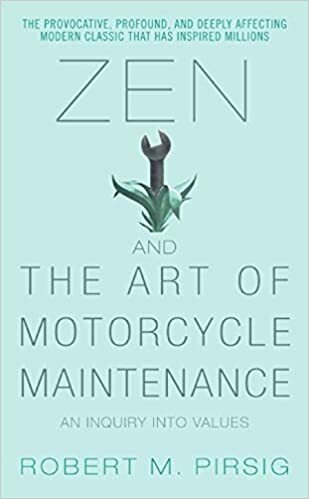 In Zen and the Art of Motorcycle Maintenance, by Robert Pirsig, one thing the narrator talks about is that many people don’t pay attention to their work, but instead want to be entertained, even while working. His mechanic continually fails to fix his motorcycle, apparently due simply to sloppy work. He blames this sloppiness at least in part on the fact that the mechanics are constantly rocking out to music when he shows up, and suggests that they will be unable to focus on his bike while they are listening to music. I read this book recently, and the idea seemed kind of laughable. In the era of texting while driving, blasting Zep while cranking on some lug nuts doesn’t really seem like a big deal. I know people who watch TV while cleaning the house, listen to books on tape while writing, watch TV while eating dinner, and can’t go for a run without good music. Heck, I AM some of those people. In fact, I’m one of the worst offenders I know, which may be why this topic resonates with me. Is this a problem? I’m not sure. I get to listen to some awesome music, expand my brain with The Great Courses on audio book, and half-way enjoy myself at all times. My work may or may not suffer, so I’ll put that in the ‘maybe’ category. One downside that I never truly enjoy the things I’m using to distract myself – it’s hard to focus on the newest episode of Sherlock if I’m constantly running out of the room to organize something. The other, possibly more important issue, is that it turns everything else in my life into a drag. Going for a run, lifting weights, cleaning the house, washing dishes, analyzing data, writing a book, biking to work, even eating dinner, etc. All of these things become chores, even when they don’t have to be, because I’m distracting myself from them by doing something ‘more entertaining’ at the same time. But many of these tasks when I focus on them, aren’t tasks at all, but rather something I can enjoy, or even get passionate about. Previous PostBJCP style #2: Belgian blonde (18A)Next PostWhy does science so often seem to disagree with itself?? Thoughts for new scientists or non-scientists.